Kronos Quartet were named after Chronos the god of time and time featured heavily in Sam Green’s lecture/documentary, A Thousand Thoughts. 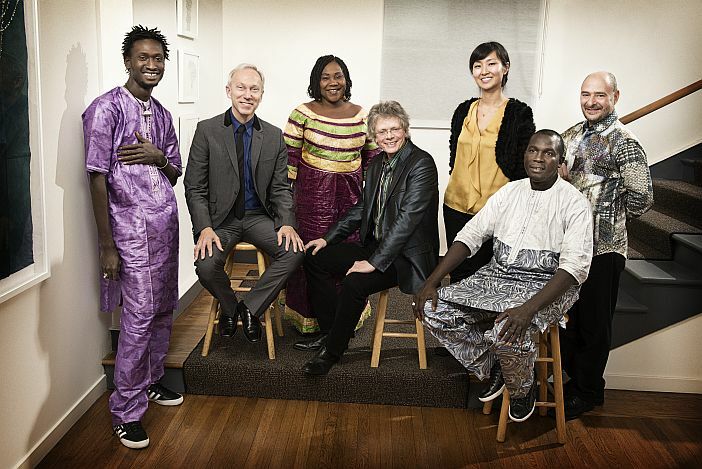 This was the 45-year history of founder member David Harrington’s constantly evolving string quartet, which saw the Quartet play along with various legends of modern classical music, from minimalist Terry Riley, whose ‘Requiem For Adam’ was an early inspiration, to Wu Man the Chinese pipa virtuoso. Along the way, there was playful mickey-taking of Macca and some shocking 80s fashion faux-pas but all the way through we were treated to personal tributes from old friends such as Philip Glass and Laurie Anderson and the ensemble members themselves, past and present, recalling personal triumphs and tragedies. The narration ended with the question of how Harrington’s two-hundred-year-old violin found its way to Seattle where he acquired it, and whether in another two hundred years time if people will be asking the same question, should it survive that long. Ever contrary, they finished with a rousing old-time fiddle version of Ervin T. Rouse’s classic ‘Orange Blossom Special’. After the break the Quartet returned, divided into two by the Trio Da Kali singer Hawa Kassé Mady Diabaté on a slightly raised platform, her bandmates bookended on either side of the strings. They played through their recent album ‘Ladilikan’ with balafon player Fodé Lassana Diabaté’s mallets a blur as his speedy solos raced over the Quartet’s strings and steady bass of Mamadou Kouyate’s ngoni guitar. David Harrington has previously compared Hawa to Mahalia Jackson and on the gospel classic ‘God Shall Wipe All The Tears Away’ the power and passion in singer’s voice shone through to validate this high praise. The strings combined to make a harmonium sound that perfectly complemented the vocal. ‘Eh Ya Ye’ ended the evening and exemplified the fusion of sounds and styles with each group’s sounds working independently yet combining perfectly. All performers couldn’t help but smile at the end and the standing ovation was well deserved. Even Guest Festival Director David Shrigley left with a big grin on his face.